The Macalester community is proud to award the Jack and Marty Rossmann Excellence in Teaching Award to Dr. Roopali Phadke. This is Roopali’s eighth year as a member of the Environmental Studies Department and she received tenure in 2011. She is an extremely talented teacher, advisor, and research mentor. Roopali’s courses offer a rich blend of traditional classroom learning and experiential projects that stretch beyond the boundaries of the college campus. 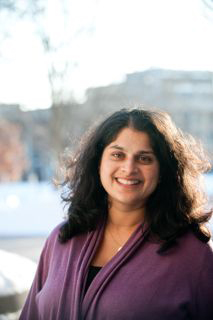 Roopali has worked hard to cultivate relationships with individuals and organizations in the Twin Cities and thus her students are afforded unique opportunities to directly engage with people at the forefront of environmental work. She regularly invites guest speakers to her classes and arranges for class field trips to organizations or sites relevant to the current theme of the course. One student who had just come from hearing a local environmental journalist speak in Roopali’s Science and Citizenship class stated that it was one of the most enjoyable and thought-provoking hours of classroom time she has ever spent at Macalester. Another student in their nomination letter for Roopali stated, “Roopali’s teaching style is extremely intentional, being varied and inclusive of different learning styles. I have taken many classes with Roopali, and they all use different teaching techniques from lectures, role plays, group projects, and so many more. Students are expected to step up to the plate in their own learning, but we also are given the guidance and support via handouts and one-on-ones to do the work to the best of our ability.” “She is engaging, organized, and keeps classes on-topic, fun, interesting, and timely to current issues.” It is no wonder that Roopali’s courses are highly sought after. A particularly good example of how Roopali’s teaching stretches beyond the traditional classroom is the seminar she created for students to take while completing their semester-long internship requirement, the Environmental Leadership Practicum (ELP). The class is academically rigorous, with weekly scholarly readings, writing assignments, discussions, and short presentations around questions such as what it means to be an environmentalist in today’s world, and how to define and pursue leadership. Woven throughout the semester are also many personal reflections and practical exercises focused on preparing students for life after college, and helping them discern their own place in the environmental movement. The course includes a Mock Job Interview and Career night, where students submit a cover letter and resume and, during class, interview with a local alumnus working in the environmental field. The interviewers provide immediate feedback to students on their interview strengths and weaknesses. Also there is a “Conversations with Recent Grads” evening with a panel of alums who are either newly in graduate school or working for local environmental organizations. A particular highlight for students is a session of personal reflection and conversation on the meaning of “vocation” in the environmental field. Students appreciate this opportunity for deep, personal reflection. It is not a typical component of a college course, and students consistently note that it is enormously helpful to have time set aside, as part of an assignment, to ponder why they are pursuing their particular field of study. In conversations with Environmental Studies faculty from a wide variety of institutions, members of the ES Department find that this course is seen as a model for courses that should be implemented across the country. For the past four summers, Roopali designed and facilitated citizen consensus conferences in several areas of the country with contentious wind energy development projects. This NSF-funded research involved eight Macalester students as research assistants and consensus conference organizers. Roopali is a skilled research mentor. She allows student assistants a great deal of creative freedom to explore their own ideas and develop a strong level of ownership in the project, but at the same time she keeps the project on track and deftly guides student researchers toward the goals that must be achieved. She does this through a deliberate schedule of personal meetings and regular writing deadlines, with time in between for students to work on their own. All of the students involved in the project have earned authorship on workshop proceedings, and four students are currently working on a book chapter with Roopali. Not only is Roopali a great teacher and scholar she is an outstanding adviser. As one student commented, “Prof. Phadke is an invaluable resource for students interested in environmental activism. She always has a line of students coming to ask her advice as they become engaged in the community. Because of Dr. Phadke’s unique pedagogical approaches in class and her personal commitment to environmental issues, students are drawn to her for advice. She provides sound and grounded counsel to students, so that they can responsibly engage in environmental activism.” Roopali has helped students balance their passion for the environment with the academic pursuits necessary to be effective in their activism. In summary, Roopali demonstrates great talent, creativity, and dedication in her work with Macalester’s students. She exemplifies what it means to be a teacher/scholar at Macalester and the Jack and Marty Rossmann Award for Excellence in Teaching recognizes her work.